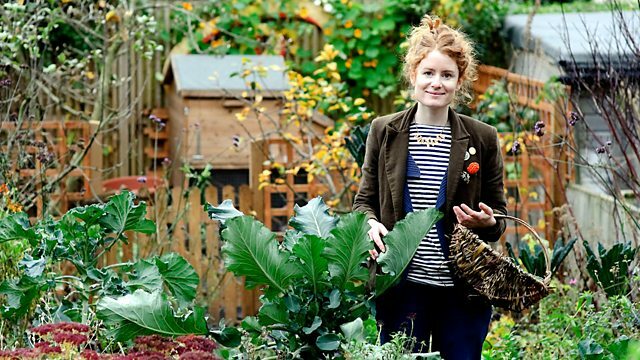 Alys Fowler tries to avoid shop-bought fruit and veg and live off home-grown produce. Root crops and leafy greens are the mainstays of an edible garden. Alys Fowler attempts to avoid shop-bought fruit and vegetables and live off her own, home-grown produce, all from her tiny terraced back garden. It's no easy task because Alys doesn't want to turn her garden into an allotment, so she's growing her fruit and vegetables among her flowers. Alys focuses on different foods and shows how anyone can grow, cook and eat from their own garden, even if they live in a city. In the challenge of turning a small urban backyard into a beautiful and edible garden, root crops and leafy greens are the mainstays. Planted amidst the majestic kales are the red stems of earthy Swiss chard and the deep purple foliage of beetroot, all delivering delicious dishes from mid-summer right through the winter. Alys doesn't go short of tasty options: beetroot and yoghurt soup, rhubarb and raspberry pie and a good supply of eggs from her two chickens.